Swift Current Broncos captain Glenn Gawdin (Calgary Flames) scored twice in the third period as the Broncos pulled off an incredible comeback against the Saskatoon Blades Wednesday. The Blades were in control of the game through the first 40 minutes with goals from four different players, but the Broncos chipped away at the lead in the third, eventually completed by Logan Barlage’s shootout-winner later on. Caleb Fantillo scored 24 seconds in and Michael Farren struck 54 seconds later to quickly put the Blades up by two. Conner Chaulk answered back with his sixth of the season to cut the Broncos’ deficit in half, but the Blades continued to charge out of the gate. 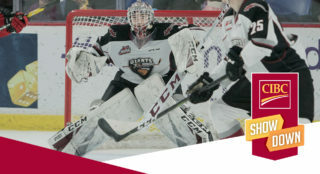 Cameron Hebig scored four-and-a-half minutes later while the Blades were short-handed and Alec Zawatsky scored early in the second to keep the Broncos on their heels and forced them to change goaltenders. The Broncos wouldn’t go away quietly though. Gawdin scored 25 seconds into the period, added his 17th of the season midway through the third and then watched teammate Artyom Minulin tie up the game late in the third. After overtime solved nothing, the game went to a shootout, where Kirby Dach scored for the Blades, but the Broncos rallied from missing their first two shots to get goals from Aleksi Heponiemi (Florida Panthers) and Barlage, completing the comeback. Joel Hofer started the game, making 11 saves on 15 shots before being replace by Logan Flodell, who stopped all 18 shots he faced, as well as three more in the shootout for the victory. Nolan Maier stopped 33 of the 37 shots sent his way in the loss. The Portland Winterhawks extended their winning streak to eight-straight games Wednesday with a big victory over the Calgary Hitmen as their road trip continued. Kieffer Bellows (New York Islanders) had a pair of goals and an assist, Cody Glass (Vegas Golden Knights) had a goal and two assists and Henri Jokiharju (Chicago Blackhawks) added two assists while Cole Kehler made 23 saves for his 15th victory of the season. The Winterhawks scored three times in a 9:23 span during the first period, featuring a pair of goals from Bellows and one from Jake Gricius. Glass scored what would turn out to be the game-winning goal 5:42 into the second period on the power play to increase the Winterhawks’ lead to 4-0. 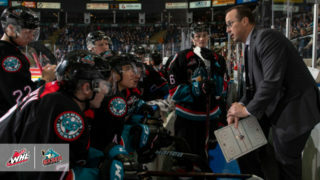 The Hitmen responded with quick goals from Tristen Nielsen and Matteo Gennaro, but the Winterhawks kept up the pressure. 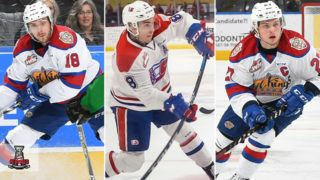 Skyler McKenzie (Winnipeg Jets), Bronson Sharp and Joachim Blichfeld scored in a 2:41 span during the final minutes of the second to keep Portland comfortably in the lead. Orca Wiesblatt tallied the lone goal of the third to get one back for the Hitmen. Nich Schneider allowed seven goals on 28 shots while Matthew Armitage stopped all nine shots sent his way in relief. The Medicine Hat Tigers completed a mid-week doubleheader sweep of the Prince George Cougars Wednesday with another offensive showing. James Hamblin scored twice, including the game-winner as part of a four-goal second period for the Tigers as they improved to 7-1 in the month of November. Max Gerlach added a goal and four points while Gary Haden, Mark Rassell and Jaegar White also had multi-point efforts. Kody McDonald had a pair of goals and three points for the Cougars, Brogan O’Brien added a goal and an assist and Vladislav Mikhalchuk added two assists in the loss. O’Brien put the Cougars on the board first, but the Tigers responded with a pair of late first period goals to take over the lead. The Tigers quickly changed the landscape of the game early in the second with three goals in a 103-second span. McDonald would score twice later in the period, but Ryan Jevne’s eighth goal of the season would keep the Tigers firmly in control heading to the third. Rassell had the lone goal of the final period while Michael Bullion polished off a 42-save performance, tying his second-most amount of saves in a single game. Taylor Gauthier and Isaiah DiLaura combined to stop 35 of the 42 shots sent their way Wednesday. 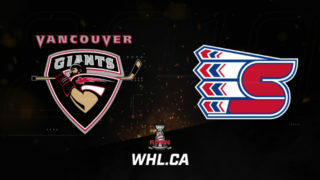 Twenty-four house after scoring 10 goals, the Lethbridge Hurricanes still had enough offence left in the tank to take down the Vancouver Giants, coming out of a tough two-game set with flying colours. Ryan Vandervlis and Ryan Bowen each added a goal and an assist while Dylan Cozens had two assists in the Hurricanes’ victory. 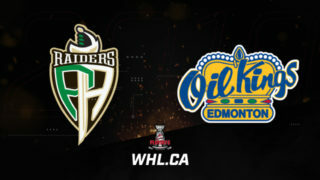 Tyler Benson (Edmonton Oilers) also had a goal and an assist while David Tendeck made 35 saves in the loss. Giorgio Estephan’s 12th goal of the season opened the scoring, followed shortly after by Benson’s goal to tie the game up, though Bowen’s goal kept Lethbridge up by one heading to the second. In the middle period, goals from Vandervlis and Jordy Bellerive (Pittsburgh Penguins) broke the game open to keep the Hurricanes in control heading to the third. Ty Ronning extended his goal scoring streak to 11 games in the third, but Taylor Ross’ third goal of the season kept the Hurricanes ahead by a healthy margin to close out the game. Reece Klassen finished Wednesday’s game with 21 saves, earning the rookie his first career WHL victory. Six months after the Seattle Thunderbirds topped the Regina Pats in six games to win their first Ed Chynoweth Cup, the T-Birds showed they still had the number of the 2018 Mastercard Memorial Cup hosts. Matt Berlin made 33 saves, seven different T-Birds skaters had multi-point games and Seattle scored three unanswered goals in the third period to double up the Pats by a 6-3 final Wednesday. Sam Steel (Anaheim Ducks) and Jarret Tyszka (Montreal Canadiens) traded goals to keep the teams tied after 20 minutes. In the second, a pair of goals from Zack Andrusiak bookended a goal from Cale Fleury (Montreal Canadiens) to give the T-Birds the outright lead after 40 minutes. Steel tallied his second of the contest early in the third, but the Thunderbirds weren’t deterred by his game-tying goal. Sami Moilanen Donovan Neuls and Matthew Wedman all scored in a 6:07 span in the second half of the third to take the lead for good while Berlin made 11 saves in the third to keep the score in favour of Seattle. Tyler Brown stopped 34 shots in the loss for Regina. 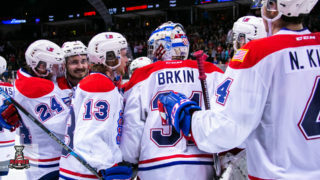 The Spokane Chiefs headed into American Thanksgiving weekend on a positive note, downing the visiting Kelowna Rockets by a healthy 6-2 margin. Zach Fischer (Calgary Flames) had a goal and an assist while six different Chiefs skaters scored in Wednesday’s victory. Fischer and Filip Kral scored the only goals of the first period to put the Chiefs up 2-0 after 20. In the second, the Rockets responded with goals from Conner Bruggen-Cate and Carsen Twarynski (Philadelphia Flyers) to even up the game, but the Chiefs kept coming. Ethan McIndoe and Eli Zummack added goals later in the second to restore the two-goal lead heading to the final period. In the third, Milos Fafrak scored his first career WHL goal while Riley Woods added his ninth of the season to round out the scoring. Dawson Weatherill made 18 saves on 20 shots to earn the victory. James Porter faced 46 shots Wednesday, stopping 40 of them. The Chiefs head into Thanksgiving with a victory! There’s a new shutout king in Everett. Carter Hart (Philadelphia Flyers) stopped 43 shots to break the Silvertips’ franchise record for clean sheets with his 21st career blanking in a 3-0 victory over the Tri-City Americans Wednesday. Hart stopped 12 shots in the first, 10 more in the second and 21 in the third to blank the Americans, the third time he’s done so in his WHL career. Goals from Kevin Davis and Martin Fasko-Rudas in the first, followed by a goal by Bryce Kindopp in the second rounded out the Silvertips’ offence Wednesday. Fasko-Rudas’ goal was the first of his WHL career. At the other end of the rink, Beck Warm stopped 24 of the 27 shots sent his way. He is now the all-time leader in Tips history. And 5 off @TheWHL record.